If you ship hazardous materials, compliance is a big part of your world. But have you ever stopped to think about what compliance really is? Compliance is getting your shipment there without frustration. Compliance is protecting people, property, and products. Shipping labels play a key role in making sure your shipments stay compliant. 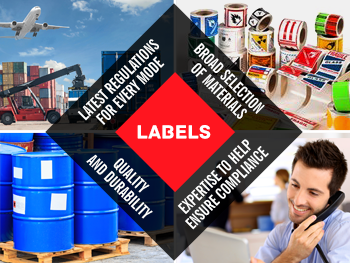 Labels that don't fall off in transit (even with rough handling), stay legible in all types of weather, and meet the latest regulations, can make all the difference. Shipping labels are the first thing an inspector sees. Labelmaster is ready to help make sure your shipments pass inspection with solutions for every application. A broad selection of blank and custom labels in a variety of colors and sizes. We know every business is different. That's why we offer a wide range of label materials and styles to choose from. In addition, many of our labels can be personalized with your company information or specific UN numbers, saving you time and effort with every shipment. We can also create customer labels from scratch — and to exact specifications — to meet your unique needs. Simply tell us what you'll be using the labels for, and our experts can help determine the best size, material, adhesive, etc. for your application. 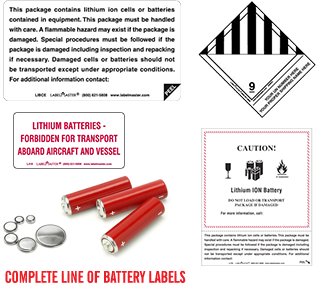 As dangerous goods (DG) shipping regulations continue to change, especially with regard to lithium batteries, we are constantly updating our solutions to simplify and streamline the compliance process with the latest battery labels. 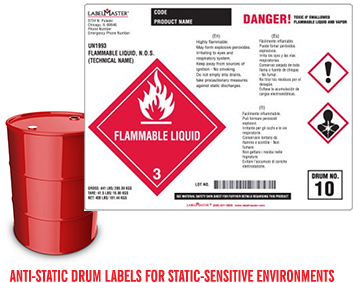 We also offer specialized solutions for specific customer needs, like our innovative series of anti-static drum labels for static-sensitive environments. If you have a unique situation or a particular need when it comes to DG shipping labels, don't hesitate to five us a call at 800.621.5808 or contact us online. We can help.